The revolutions in Tunisia and Egypt are the single most important mass political developments in advancing the cause of democracy and challenging global imperialism since the colour revolutions of 1989 and the Bolivarian moment in South America. But the Arab spring has proven to be complex, contradictory, and incomplete. The revolutionary surge has taken a number of directions across a variety of national circumstances: in violent, unresolved processes when generalized to Yemen, Syria and Libya; to preventive reform moments in Jordan and Morocco; and Saudi counter-revolution in crushing the Shia dominated democracy movement in Bahrain. The struggle in Libya has raised a powerful set of contradictions – western intervention in the name of humanity against Gadaffi’s violence, but shaping and potentially deflecting the resistance movement, and drawing western liberal opinion behind imperialism for oil and order. And the Arab revolution is incomplete. As one Egyptian revolutionary describes it: ‘In 1952 we had a coup for a revolution. In 2011 we have what appears to be a revolution for a coup.” To this point, the successful Tunisian and Egyptian revolutions have displaced dictators but not the autocratic and neo-liberal systems that underpinned them. In 2003, George Bush announced the United States would invade Iraq as the ‘Arab Street’, i.e., Arab popular opinion, counted for nothing. The events of the last year have made the Arab Street once more a political factor. On December 17, 2010, a young Tunisian street merchant, Mohammed Bouazzi, set himself on fire to protest police harassment. That single act of defiance sparked a mass movement to demand the end of the Ben Ali kleptocratic state - where the ruling family systematically pillaged every economic opportunity, from business to jobs. On January 14, Ben Ali’s family fled to Saudi Arabia and a new Transitional Council promised elections for a Constituent Assembly to establish a constitution for a democratic state. The example of Tunisia inspired Egyptian Democracy Rights activists to openly protest the corrupt and repressive dictatorship of the Mubarak family. These protests grew to demonstrations of over two million people who occupied Tahrir (Freedom) Square in Cairo and fought off repeated attempts by security forces to evict them. As important, on February 8, an unlimited general strike was declared by the nascent free trade union movement. All of these struggles forced Mubarak’s resignation on February 14. Behind ‘the facebook revolution’ there was the beginning of a real revolutionary crisis. Again a transitional government has been established, this time by the Egyptian army by its Supreme Council of the Armed Forces. They too have promised a Constituent Assembly to write a new constitution, though elections have now been delayed until November. These events have encouraged a variety of insurrectionary struggles – by urban workers and youth in Sanaa in Yemen, which has been tested by violent clan conflicts in both South and North Yemen; by the Sunni majority of Syria who have been met with bullets to result in over 3000 dead; and by civil war in Libya against the last Arab ‘socialism of the 1960s, Gadaffi’s Green Revolution. But Egypt is the key. It is the single largest Arab nation with over 81 million people, with the region’s largest working class, and on the front lines of American, Israeli, and Saudi imperialism in the middle-east. 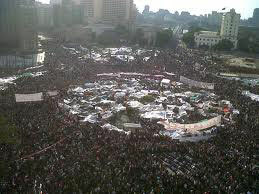 The Egyptian revolution did not happen in a vacuum. Egypt has been a neo-liberal laboratory for the region since the 1980s. The original Egyptian Arab revolution of 1952 took the direction of an ‘Arab Socialism’ under Nasser in the 1950s and 1960s. This took the form of an aggressive state capitalism, the nationalization of the Suez Canal, a social contract with peasants and workers, in land reform, food subsidies, and jobs for newly educated youth, and an attempt to build pan-Arab unity. But this national road to socialism foundered on internal and external contradictions, in prioritizing state growth over people’s welfare, and against American-Israeli imperialism – losing the Sinai in 1967, to only regain it after a costly war in 1973 and a fundamental realignment to the United States by 1980. The Mubarak New Democracy regime completed this turn towards the market by reversing nationalization, reducing the public sector from 70% to 30% of GDP, ending land reform, and dramatically cutting food subsidies. The result has been to impoverish the majority with 40% unemployment, a falling standard of living (80 dollars per month) and falling life expectancy. For those with jobs, the majority of Egyptian workers now work on daily contracts, i.e., with no job security. The most secure were the one in fifty Egyptians who worked for the security forces. This dire situation has given rise to a variety of complex responses, from political Islamism that has used Saudi funding to draw the poor into reactionary populist movements to the rebirth of a Marxist left that has worked to build a free trade union movement that sponsored a rising strike movement from 2006. In this neo-liberal context, the Tunisian and Egyptian revolutions therefore are class moments to define what a democratic Arab future will be. For those still in the first stage of struggle against autocracy, there are many valuable lessons, and limits, to learn from Tunisia and Egypt’s successes. The sparks and forms of struggle have been varied, but they have taken the shape of vast civil non-violent mobilizations, with mass self-organization through popular committees in neighbourhoods and workplaces. Such mobilizations have proven effective in defeating police and security forces, and splitting elites, especially the military. But where the dictatorship cannot be divided from elites, on grounds of ethnicity and sectarian privilege, the question of physical struggle is posed as in Libya, Syria or Yemen. An even greater challenge is the question of consolidating the political revolutions in Tunisia and Egypt. As revolutionary socialists have learned from long, hard experience, only the perspective of permanent revolution can shape efforts to consolidate and deepen each revolution’s possibilities. Permanent Revolution was an idea developed by Marx in response to the failure of the 1848 European revolutions. In the face of successful political revolutions to overthrow European monarchies, bourgeois elites hesitated to consolidate the economic and political measures necessary to bar the return of reaction. Ultimately, the new capitalist elites chose to align themselves with reaction against the social justice measures that would be required. This led Marx to argue that socialists had to be ‘the extreme Democrats’ in being prepared to independently organize and pursue the goals that had mobilized the vast majority who had fought for fundamental change. Trotsky developed this analysis further with the failure of the 1905 Russian Revolution. Only an independent working class movement could advance the most elementary political democratic goals and social justice measures. In the context of the successful 1917 revolution this also involved making conscious how alliances could facilitate this process, the practice of the United Front. In the case of Egypt, socialists have been confronted with precisely this situation. The Supreme Council, despite democratic promises, did not at first move to try Mubarak. It appointed itself the guardian of any constitution making process, delayed elections, and reinvented the security apparatus. Big business has rallied to its side to also proclaim that neo-liberalism is inviolate, that one cannot re-nationalize the economy despite a growing inflationary crisis. This conservative retreat from the most elementary democratic goals has led the Egyptian left to launch a second wave of political struggle. On May 27, it called for a national mass mobilization to press the ‘temporary’ military government to: try Mubarak for his role in the death of 865 protesters in the course of the revolution; end the persecution of democracy activists; end the role of the military as the sole guarantor of a new constitution; and to establish a living minimum wage. Over 1 million people participated, despite military, liberal and Islamist opposition – and a new living wage minimum has been proclaimed, if not acted upon. But this is a very complex situation. Where the left had engaged in temporary political united fronts with Islamists prior to the revolution, now the lines are drawn as Islamists like the Muslim Brotherhood and Salafists campaign to hijack the revolutionary process for a conservative consolidation (as in the July 29 Tahrir Square rally) – against independent working class organization - and with their own rumoured pact negotiations with the army. In response, Egyptian revolutionaries like the Revolutionary Socialists have worked on many fronts to build a socialist alternative: in fostering independent worker organization in the Popular Committees and Independent Unions (going from six to over one hundred unions); in fostering political united fronts with liberal, socialist, and worker elements – in founding the Democratic Workers Party; the Socialist Popular Alliance Party; and a Socialist Front to coordinate the work of Marxist groups. And, critically, waging a continued political struggle to advance democratic goals that focus on political freedoms and social justice goals as an alternative to a return of neo-liberal secular authoritarianism or a reactionary Islamist, nominally democratic, republic, both premised on deals with the army. What can socialists do in solidarity with the Arab revolution? One, where we can contribute to the liberation struggle as in breaking the siege of Gaza (as in the example of the Egyptian border being temporarily opened or the Freedom Flotilla campaigns), contesting Israeli imperialism with the BDS campaign, or strengthening the anti-war movement in opposing Western intervention, we should do so.